A special display at the downtown Nordstrom features new and exclusive Dior styles amid lots of pink bees. 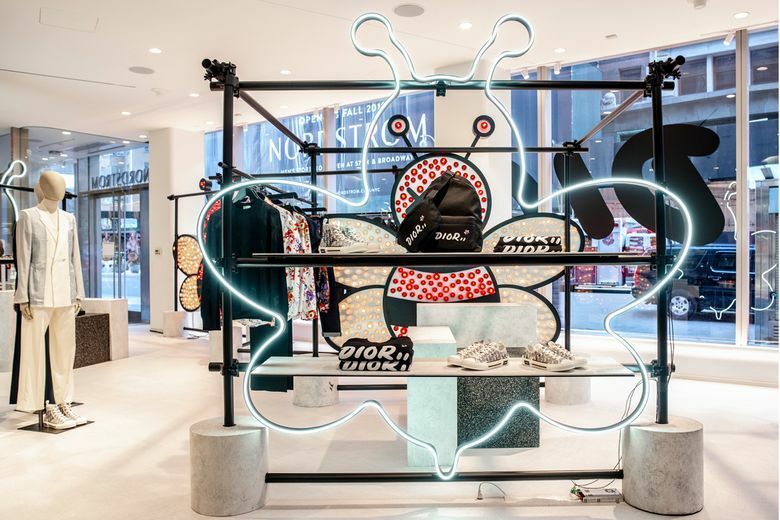 Nordstrom is generating serious buzz for new Dior styles featuring the KAWS bee on a series of exclusive styles for the locally based retailer. 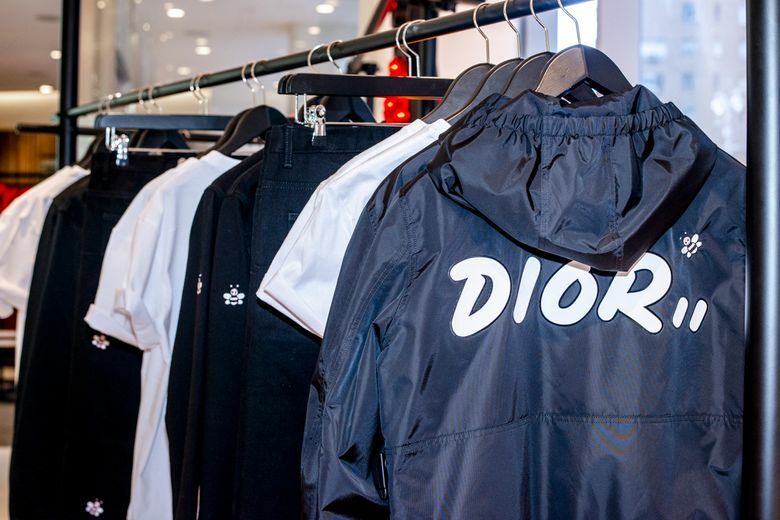 Opening today (Feb. 8) at the downtown Seattle Nordstrom, the runway-inspired display of new Dior ready-to-wear items includes items from Kim Jones’ first collection for the French luxury house. 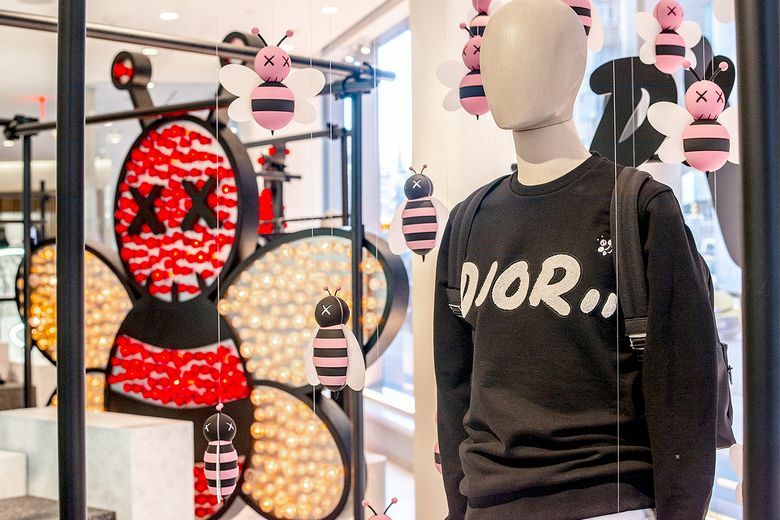 The pieces feature commissioned work by artist KAWS, who reimagined the Dior logo and iconic bee, both of which make appearances on a selection of T-shirts, jackets, backpacks and more. Although the prices, ranging from $590 for a T-shirt to $2,350 for a hooded jacket, may be out of range for most, the shop itself is still a fun visual installation that is exclusive to the downtown Seattle location and the Nordstrom Men’s Store in New York. It features black scaffolding structures mirroring the show set from the Dior Men Summer 2019 RTW show, along with 8-foot, large-scale structures of the KAWS bee, custom-made in black metal with pink cabochon lights. The Nordstrom-exclusive styles include a canvas waistpack ($870), canvas tote ($2,000) and canvas backpack ($1,500), along with the T-shirt and hooded jacket mentioned above and a crewneck sweatshirt ($950). The special installation — Concept 002: Dior — is vice president for men’s fashion Sam Lobban’s second project for Nordstrom Men, following Concept 001: Out Cold, a curated collection of top snow and rain gear.